To start, let me just say that I love Jacob Lynch as a character. I bought his whole crew when he was released at Gencon 2012 and painted them up faster than any I had bought previously. It could just be my proclivity for cheering for the morally complex bad guys (I still think Lex Luthor has a point about Superman) but this crew has always been attractive to me. I like the look. I like the focus on card advantage. These guys are my kind of scum. Lynch is the proprietor of the Honeypot casino, a den of debauchery where any vice can be explored with the right amount of scrip. The story started out with him down on his luck, about to end up on the wrong side of a loan with the Ten Thunders and desperate. Enter Messirs Graves and Tannen, a pair of disguised Neverborn with an offer he can’t refuse. You see, something old and unspeakable lives below the Honeypot (that’s quite the double entendre sentence), a creature from the age of the tyrants who just wants to find a host to latch onto so it can get out and feed. 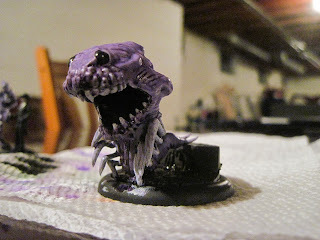 All Lynch has to do is bind with this Hungering Darkness and spread his influence through the city in the form of Brilliance, the most potent and intoxicating Narcotic to hit Malifaux and which, incidentally, allows the HD to feed off of their essence until only a burned out shell remains. Fast forward, and the Honeypot is a runaway success. Customers are streaming in to try their luck at the tables, spend time with the beautiful ladies, and have a taste of the good stuff that makes it all possible. But Misaki knows what resides inside Lynch now and wants to use it for her own purposes, while the Neverborn could frankly give a damn what they want, being interested only in the corruption and ultimate destruction of the humans who have invaded their home. Once again, Lynch finds himself being pulled between two masters who, if we’re being honest, don’t EXACTLY have his best interests at heart, and trying to find a way to get out from under their thumbs with his skin intact. In his first iteration, Lynch played very much as his fluff would suggest. He was pretty unassuming and basically snuck around the board completing objectives while the rest of the crew induced havoc. In 2nd edition, by contrast, he appears to have embraced some of the powers made available to him and has become quite a bit more “hands on” in his approach. His main offensive weapon, his hold out pistol, has a trigger for each suit and the ability to pitch a card from his hand and apply that suit to the duel total. The most obvious is the Ram trigger that converts his damage profile to 4/5/6, but the others can be situationally useful as well. Lynch also has an unorthodox ability called Ace in the Hole that allows him to grab any aces flipped or discarded by other members of his crew before they hit the discard pile, effectively allowing them to utilize Defensive Stance and abilities like Rapid Fire and Flurry without giving up card advantage, which we all know I appreciate. But when his activation comes around, what do we do with all those aces? Well, there’s always his (0) action, Mulligan, that lets him shuffle three cards into his deck and draw three new ones which, when paired with his “Woke Up With a Hand” upgrade, basically allows you to draw a brand new hand at the end of your turn in exchange for waiting to activate Lynch last. Also, though I’ve never successfully used the ability, the same upgrade gives him a (1) action called Final Debt where a target with the Brilliance condition takes a point of damage for each card in Lynch’s hand. I’ve read a couple of different suggestions on how to use Lynch in games. Obviously he’s a much more effective combatant now, but he still has no real defensive abilities besides making people take two damage when they cheat in a duel with him. As such you kind of have to pick your spots with him and make sure he’s well supported. I personally like to save him for the end of the turn and use Mulligan and Woke Up With A Hand to ensure that I can dominate any duels that Lynch is involved in since my opponent will likely have depleted their control hand by that point. The holdout pistol’s ram trigger gives him a surprisingly effective damage output. Others have suggested utilizing his “Play for Blood” attack to spread more Brilliance through the crew, effectively using Lynch to optimize things for his minions, but I’ve personally found the Beckoners and, to a lesser extent, Hungering Darkness to be better at that job, especially given the fact that “Under the Influence” drops off at the end of the turn. His walk of 4 makes him not particularly speedy, so objective grabbing is probably better accomplished by other crew members as well. So, honestly, I think the best way to use Lynch is probably as a hand manipulator and surgical damage dealer. Of course, just like Walt, Lynch can’t do it all on his own. He needs a partner, though in this case his partner is a lot more Gus Fringe and a lot less Jessie Pinkman. The real power of the crew, both in terms of the fluff and on the tabletop, is the Hungering Darkness. Despite resembling the Nightmare Edition of a Hungry-Hungry Hippo (Gencon 2014), the HD is one of the nastiest melee monsters in the game. A 50mm based model with a 3” melee range basically means everything is within his threat radius on the second turn. He’s incorporeal and heals himself with successful melee attacks. He has an enemies only Obey spell. He gets plus flips to basically everything when you are “Under the Influence.” And all this comes before you put any upgrades on him. Of course, probably the most important upgrade choice you make for HD actually gets played on Lynch. Both are limited, so you have to make a call here, but the choice is between either giving HD an additional CA action per turn (his melee attacks run off of Ca) and makes him Terrifying (All) or gives him Bad Juju’s “When this model would be killed, bury it instead” and lets you resummon him when a Brilliant model dies. This was actually kind of a quandary for me when they introduced this change between the closing of the Beta and publishing the rulebook. I can see games where both would be useful. The ability to effectively prevent any scoring from killing HD (since burying him doesn’t count as killing him) makes it a pretty solid denial tactic for Reckoning or henchman-kill based schemes. On the other hand, if you know you’re playing Ressers or one of the construct-based Arcanists, Terrifying All becomes worth an investment, to say nothing of the added offensive power. I tend to alternate between the two, particularly when running the crew as Neverborn (Nexus of Power is incredibly strong on the big guy and can make Rising Sun sort of superfluous.) We’ll have to see if, after several games, one ends up supplanting the other. The friendly staff members of the Honeypot are always ready to serve. The two remaining “in theme” models for the crew are Beckoners and The Illuminated. Beckoners were previously almost too good, effectively spreading Brilliance through the enemy crew at will and giving you the ability to lock down most models in the opposing crew by putting them on negative flips to hit them. They’ve been toned down a bit at this point, but two of them are probably still an auto-include in most Lynch builds. Lure is just too powerful of an ability to ignore in an objective based game. They still have the negative flip to opposing models’ attacks when Brilliant, but their “The Party Never Ends” range has shrunk significantly, making it easier for models to get away from them and sober up. They’re not going to kill anybody, but that’s not what they’re here for. Put them in. Paint ‘em up pretty. Thank me later. I am not an expert on the Illuminated, I’ll confess. The first time I tried to use one in a 2nd edition game, it had a bad case of “new model syndrome,” walking up behind cover against a Sonnia player only to be set on fire by a Witchling I had lured in and subsequently blasted to pieces by her on the first turn. My take on them at this point is that they’re worth including now and then but will probably see limited use after the Wave 2 minions come out, simply because they seem to be pretty good at a lot of things but not great at anything. I like the combination of armor, regen, and their Brillshaper healing spell for resilience, and Flay is always good, but the model’s statline is otherwise fairly unremarkable and their ability to spread brilliance requires a trigger and isn’t particularly efficient even when you do hit it. If they were a bit cheaper I’d be singing a different tune, and it’s possible I’m just off base or not using them right, but they just don’t feel like you’re getting a full 7 stones worth of model with these guys and, unfortunately, will probably be replaced by better options once we see what’s coming with Wave 2. Update: Many people have written/commented to me that the Illuminated are, in fact, better than I’m giving them credit for here. One of them did help me to win a game the previous weekend (as I’ll discuss in my upcoming post about Vassal,) mostly by being able to weather a storm of ice blasts from Rasputina while in defensive stance to hold the Turf War marker. Certainly, Armor+Regen+Brillshaper makes for a pretty tough model. Also, against a Brilliant target they will certainly do a lot of damage. I maintain my concern that the model may end up on a pile of “hey, remember those things? They were pretty good” once Wave 2 comes out, but I wanted to make sure people are aware that this may be a minority opinion on my part. The question of what faction to run the Lynch crew with has always been a little one-sided for me from a feel perspective. He just seems like he fits better with the Neverborn. These are horrific monsters doing terrible things to the people who step through the casino doors, and you don’t get much more Neverborn than that. Plus, my Cade and Teddy are both wearing formal attire, so they’re dressed and ready for a night on the town with Lynch. Mechanically, the Neverborn fit well with him as well. As mentioned, Nexus of Power played on HD makes him pretty difficult to take down simply by pouring Soulstone’s down the big guy’s throat to heal any damage the opponent puts on him. Terror Tots become some of the best objective grabbers in the game if you can manage to cycle through your deck and find the ace of masks, since you can cheat the flip for their sprint ability then pick the AoM back up thanks to Lynch. The Doppleganger gets a number of tasty (1) actions to copy between HD, the Beckoners, and the Tot’s unlimited sprinting. Teddy gets to flurry for free and provides a pretty solid 1-2 punch with the HD. I’ve played them much more often as Neverborn, and have never felt that I was missing out. That’s not to say that the Thunders don’t bring some solid advantages as well. Recalled training is just good no matter who you put it on. The Archers get to Rapid Fire for free thanks to Lynch, and their ability to shoot into melee at will makes them pretty useful to back up the HD. I’ve always liked putting Yamaziko and Hungering Darkness together to form a massive wall of denial in the mid-board, especially for scenarios like Squatter’s Rights. Misdirection is always handy and, with the ace of masks trick, can end up being pretty effective to block opponents’ attacks against your Henchmen and/or Enforcers late in the turn when the opponent’s hand is shrinking. Personally, I don’t think you can go wrong and your choice may just come down to preference and playstyle. 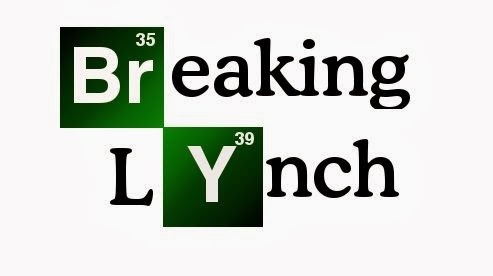 Lynch is overall a good crew with some very interesting tricks. I don’t know that he’s ever going to end up being classified into whatever shakes out as the “Top Tier,” but I also don’t think the crew has very many particularly bad match-ups either. I’m interested to see what they do with the rest of the crew in Wave 2 (using the Depleted for reliable, cheap objective grabbers would be excellent.) In the meantime, have fun spreading addiction and corruption through Malifaux, and let’s all hope that Walt finally gets what’s coming to him, and that Jessie gets revenge on that piece of crap Todd.